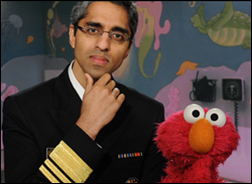 I’m a big fan of former Surgeon General Vivek Murthy, MD and of his willingness to explore popular culture and current trends to further public health. (If you haven’t seen him talk with Elmo about vaccinations, it’s worth a watch.) His recent contribution to the Harvard Business Review addresses the “loneliness epidemic” that is a growing health issue for many people. He notes that although we are technically more connected than ever before, greater numbers of Americans report feeling lonely. This isn’t the first time someone has written about the concept of loneliness. The Atlantic broached the idea that social media was making us lonely back in 2012. Even five years ago, it described us as “living in an isolation that would have been unimaginable to our ancestors, and yet we have never been more accessible.” I got a kick out of rereading the article, which described a world prior to the Facebook IPO. It addressed ideas that behaviors such as passive consumption of social updates and individuals broadcasting updates to the world links directly to feelings of disconnectedness. Reading the carefully curated updates of others has also been linked to depressed mood. Of course, Facebook and other social media platforms aren’t always passive. I ran into a situation today with one of my hobbies, where I ran into an issue that could only be described as a calamity. A quick post to a hobby group had an answer for me in exactly 53 minutes, from someone I have met a couple of times and trust but don’t feel I know well enough to pick up the phone and call. We had some back-and-forth about the issue and my project, and I felt like I now know her well enough that next time I might just pick up the phone. After a couple of other people weighed in on my issue, I walked away with a greater feeling of connectedness rather than loneliness. This underscores the need to not paint technology as the culprit with too broad a brush. Evaluate the current state of connections in the workplace. Make strengthening social connections a strategic priority. Encourage coworkers to reach out and help others. Create opportunities to learn about the personal lives of your colleagues. He expands on those actions by talking about concepts that we don’t consistently see in many workplaces, such as a culture of kindness and identifying the building of high-quality relationships as a priority. I’ve been privileged to work for people who embrace these ideas, encouraging colleagues to get to know each other beyond our roles as workers and more as people. At one office we were encouraged to personalize our workspaces, where another restricted display of non-approved decorations. It isn’t hard to guess which one led to greater personal conversations and understanding, and helped build some of the relationships that keep me sane on a regular basis. In other workplaces I’ve seen employees intentionally pitted against each other, or treated so unequally that most people would have significant challenges trying to build relationships in those environments. I try to include a review of workplace culture as an element in many of my engagements, and it’s good to see a respected source like Vivek Murthy give credence to the need to address what people often consider the “soft” disciplines. Murthy closes citing a concern that “if we cannot rebuild strong, authentic social connections, we will continue to splinter apart.” We’re certainly seeing plenty of splinting in our world today, and in many workplaces. I hope his efforts to bring a discussion of loneliness to the fore garner some real attention. I’d be interested to hear whether any of the clinical informaticists out there are pursuing work in this area, or whether loneliness and social connections are being addressed in your workplace. Have strategies to bring people together? Email me.